Enjoy our Express Breakfast 6:00AM - 11:00AM during the week and until noon on Saturday and Sunday. Coffee, espresso, pastries, salads, and sandwiches are available To Go at our Bakery Counter 6:00AM - 11:00PM every day. Located in The PALAZZO - Resort - Hotel - Casino next to the Palazzo Theater. Parking is available directly underneath the Palazzo tower. Come up the escalator to the casino floor. We are in the left hand corner of the casino, next to the Jersey Boys theatre. 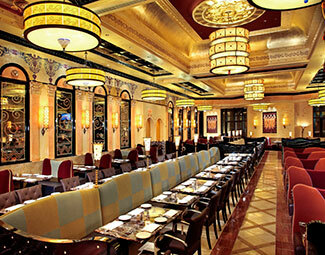 Have your next event at Grand Lux Cafe! Featuring full media capability, our Private Dining Room seats 70 guests and is available for Breakfast, Lunch, Dinner and Late Night Events. Call 702-414-3883 for more information.